Doan Thi Huong, center, is escorted by police as she arrives for court hearing at Shah Alam High Court, Malaysia, June 27, 2018. Circumstantial evidence against one of the two women accused of poisoning to death the estranged half brother of North Korea's leader is feeble, with many doubts and gaps that "stood out like a sore thumb," her lawyer told a court on Wednesday. 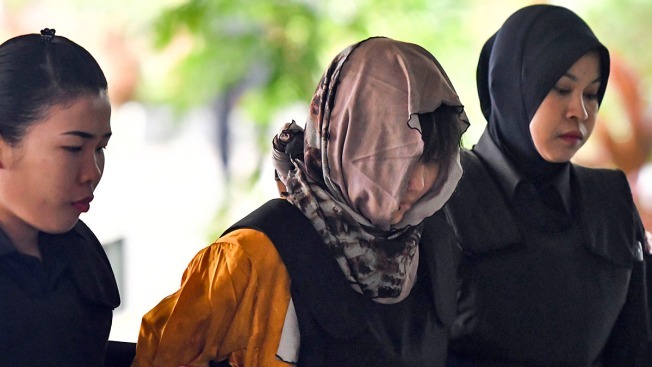 The 25-year-old woman, Siti Aisyah of Indonesia, is accused along with 29-year-old Doan Thi Huong of Vietnam of smearing the banned VX nerve agent on Kim Jong Nam's face in a crowded airport terminal in Kuala Lumpur on Feb. 13, 2017. The women, who face the death penalty, have pleaded not guilty, saying they thought they were taking part in a harmless prank for a hidden-camera show. They were charged with colluding to murder Kim with four North Koreans who fled the country on the day of the incident. The crux of the case revolves around whether the women intended to kill Kim or if they truly were scapegoats duped by North Korean agents into taking part in a high-profile political assassination. Aisyah's lawyer, Gooi Soon Seng, said the prosecution's case has "left many questions and issues unanswered." 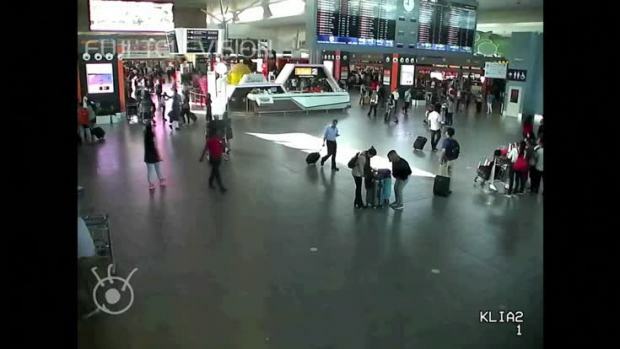 Surveillance video obtained by Fuji TV seems to show the moment Kim Jong Nam (wearing pale grey suit and carrying black backpack), the estranged half brother of North Korean ruler Kim Jong Un, was attacked at Kuala Lumpur international airport. "There were doubts and gaps that stood out like a sore thumb ... what actually happened at (the airport) at the material time has remained a mystery," Gooi said in his closing argument. "The role purportedly played by the four persons still at large will continue to remain a mystery until they are brought to the court of justice." Defense lawyers and prosecutors are expected to wrap up their closing arguments by Friday, after which the judge could take up to a month to make a ruling. If he decides there isn't a case, the women will be freed. If he decides there is, the women will be called to make their defense, which could take several months. Gooi said the prosecution failed to shed light on the motive of the murder and why Kim was targeted. He said there was no video footage of Aisyah applying anything on Kim's face, of anyone putting any substance on her palm or of Aisyah washing her hands after the incident. She didn't suffer any symptoms of VX poisoning and no trace of VX was found in her fingernails, as was the case with Huong, he said. In security video replayed in court Wednesday, a blurry and unidentified figure standing near Kim was seen hurrying away after Huong clasped her hand over Kim's face. Gooi said Aisyah's conduct — including not wearing gloves, not disposing of her tainted clothing and not trying to escape — and boasting about her role as an actress in prank videos on social media showed her innocence. In contrast, the four North Korean suspects changed their attire at the airport before fleeing to cover up their tracks, he said. "To me, the motive is as clear as daylight ... the only probable and clear indication is that it's a political assassination," the lawyer said. Gooi said the presence of a degradation product of VX found on Aisyah's sleeveless shirt was questionable because a chemist had disposed of the tainted part after testing and didn't preserve it for the court's verification and scrutiny. Gooi also slammed the police investigation as shoddy and lopsided, saying Aisyah would not have been charged if the probe was objective. He said police failed to investigate where the VX came from and that it would have been "tantamount to a declaration of war" if it was brought in by the North Koreans. Huong's lawyer was to make his closing argument later Wednesday. Kim, the eldest son in the family that has ruled North Korea since its founding, had been living abroad for years after falling out of favor. It is thought he could have been seen as a threat to North Korean leader Kim Jong Un's rule. Malaysian officials have never officially accused North Korea of involvement in Kim's death and have made it clear they don't want the trial politicized. "No scapegoats can accomplish this mission," prosecutor Wan Shaharuddin Wan Ladin told The Associated Press before Wednesday's court session began. "You must be trained. No room for failure."